Abstract For the past few decades, Bezymianny volcano has erupted once to twice per year. Here, I examine eight eruptive events between 2006 and 2010. This is the first time period for which proximal or broadband seismic data have been recorded at Bezymianny. Several recurring patterns are demonstrated in advance of eruptions. Eruptions are generally preceded by 12–36 h of tremor energy elevated by 2 to 3 orders of magnitude. Locatable earthquake activity is quite erratic in the days before eruptions. For eruptions of juvenile magma, however, the cumulative moment magnitude increases with the repose time since the previous eruption. Though tenuous, this relationship is statistically significant and could improve forecasts of Bezymianny eruptions. The most energetic eruptions demonstrate increasing multiplet activity in the run-up, followed by a rapid cessation at the time of eruption. When present, this behavior marks increasing pressure in the conduit system as degassing eclipses the capacity for venting. Very long period seismicity (> 20 s periods) accompanies some eruptions. These tend to be the same short-lived high-energy eruptions that exhibit multiplet precursors. Four eruptions are examined in detail to illustrate the variety in eruption mechanisms. Lava dome collapses, sustained eruptions, singular paroxysmal explosions and post-explosion lava flows occur in different combinations demonstrating that more than one eruption trigger is regulating Bezymianny. Compared to Bezymianny's fifty-year modern history, recent eruptions have been shorter-lived and separated by longer repose times. Some evidence suggests that these eruptions may be increasingly explosive—a speculation that carries significant hazard implications. If true, however, this threat is tempered by solid evidence that the most explosive eruptions are preceded by the clearest precursors, suggesting an ability to improve the already excellent eruption forecasts available for Bezymianny. Yasui M., Hashimoto Y., Ueda S. Geomagnetic and Bathymetric Study of the Okhotsk Sea - (1) // Oceanographical Magazine. 1967. V. 19. № 1. P. 73-85. Abstract Gases and aerosols from the 2012–13 effusive eruption of Tolbachik basaltic volcano, Kamchatka, were sampled in February and May, 2013, from a lava tube window located 300 m from the eruptive crater; temperature at the sampling point was 1060–1070 °C. The chemical and isotopic compositions of the sampled gases (92.4 H2O, 3.5 CO2, 2.3 SO2 on average; δD from − 25.0 to − 38.6‰) correspond to a typical volcanic arc gas without dilution by meteoric or hydrothermal water. Halogen contents in the gases (1.37 HCl, 0.5 HF) were higher than average arc values. The total amount of analyzed metallic and metalloid (trace) elements in the gas exceeded 665 ppm. Six most abundant trace elements, K (250 ppm), Na (220 ppm), Si (74 ppm), Br (48 ppm), Cu (21 ppm) and Fe (12 ppm), accounted for 95 of the total content of trace elements in the gas. The gases contained 24 ppb Re, 12 ppb Ag, 4.9 ppb Au and 0.45 ppb Pt. Refractory rock-forming elements (Mg, Al, Ca) and some other elements such as Ba and Th were transported mainly in the form of silicate microspheres and altered rock particles. The concentrations of metals in the eruptive Tolbachik gases are higher than the corresponding concentrations in high-temperature fumaroles worldwide, although the mutual ratios of the elements are approximately the same. The gas/magma partition coefficients of eleven elements exceed unity, including the non-metals F, S, Cl, Br, As, Se and Te and the rare metals Cd, Re, Tl and Bi. Despite the relatively low concentrations of trace elements in the volcanic gases at the highest temperatures, superficial magma degassing provides information on the sources and sinks of metals. 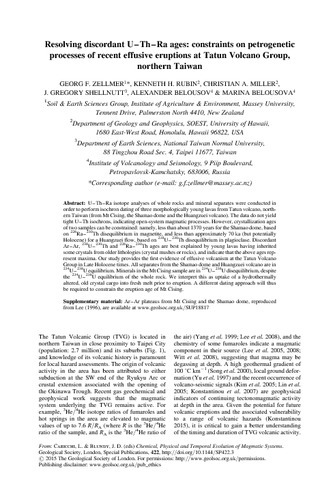 Zellmer Georg F., Rubin K., Miller C., Shellnut G., Belousov Alexander, Belousova Marina Resolving discordant U–Th–Ra ages: constraints on petrogenetic processes of recent effusive eruptions at Tatun Volcano Group, northern Taiwan // Chemical, Physical and Temporal Evolution of Magmatic Systems. // The Geological Society of London. 2015. V. 422. № 10.1144/SP422.3. Zharinov N.A., Fedotov S.A., Gorelchik V.I. 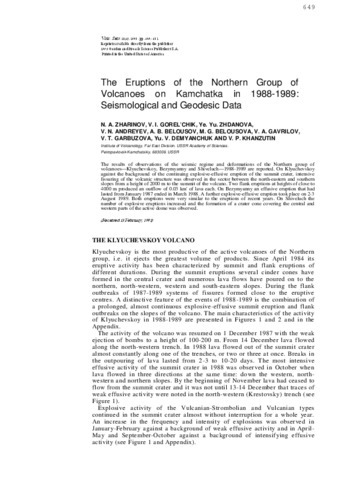 A Model for Klyuchevskoy Volcano Activity from Geodelical and Seismological Data // Kagoshima International Conference on Volcanoes: Proceedings of the International Conference on Volcanoes, Japan, Kagoshima, 19-23 July 1988. Kagoshima: Kagoshima Prefectural Government. 1988. P. 71-74. Zharinov N.A., Gorelchik V.I., Belousov A.B., Belousova M.G., Garbuzova V.T., Demyanchuk Yu.V., Zhdanova E.Yu. 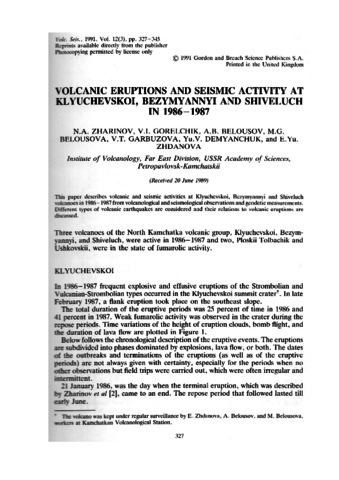 Volcanic eruptions and seismic activity at Klyuchevskoi, Bezymiannyi and Shiveluch in 1986-1987 // Volcanology and Seismology. 1991. V. 12. V. 3. P. 327-345. Zharinov N.A., Gorelchik V.I., Zhdanova E.Yu., Andreev V.N., Belousov A.B., Belousova M.G., Gavrilenko V.A., Garbuzova V.T., Demyanchuk Yu.V., Khanzutin V.P. 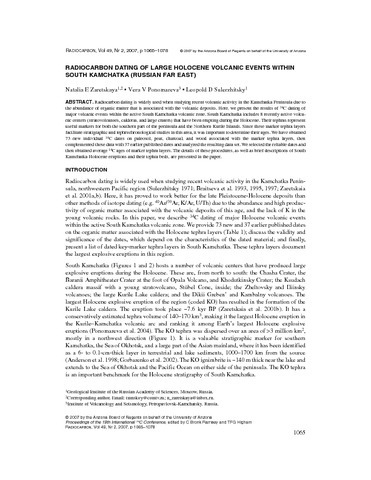 The Eruptions of the Northern Group of Volcanoes on Kamchatka in 1988-1989: Seismological and Geodesic Data // Volcanology and Seismology. 1993. V. 13. V. 6. P. 649-681. Zharinov N.A., Zhdanova E.Yu., Belousov A.B., Belousova M.G., Ivanov A.P., Malyshev A.I., Khanzutin V.P. 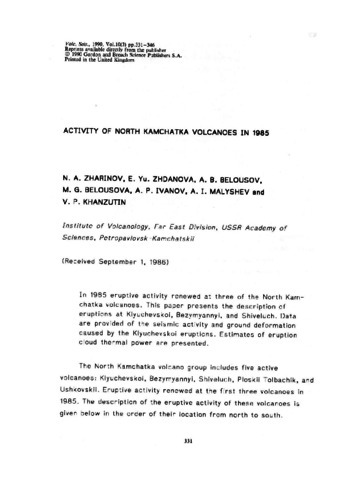 Activity of North Kamchatkan volcanoes in 1985 // Volcanology and Seismology. 1990. V. 10. V. 3. P. 331-346. Zubin M.I., Melekestsev I.V., Tarakanovsky A.A., Erlich E.N. Quaternary Calderas of Kamchatka // International Association of Volcanology and Chemistry of the Earth`s Interior. Sumposium on Volcanoes &Their Roots. Oxford: 1969. P. 111-113.